Taken earlier this month when I was in California. 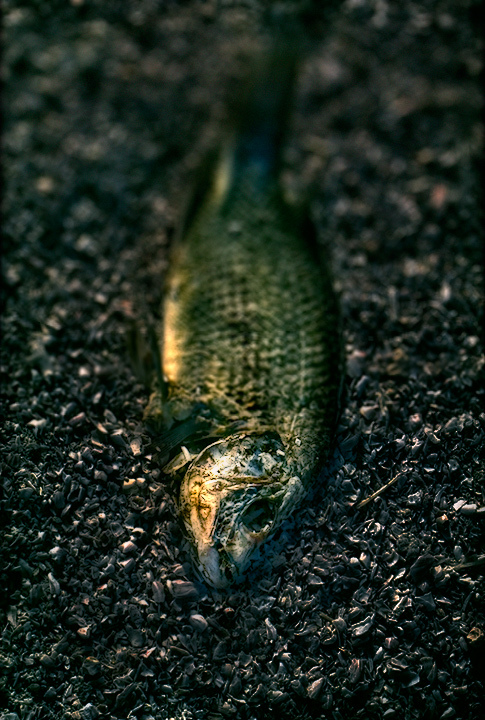 One of thousand of dead tilapia on the shore of the Salton Sea. Look at what you can do with a fresh Julienne of vegetables, some herbs and little, slow grilling. Message edited by author 2008-12-11 10:14:40. Wonderful - but in a sad way. Disturbing image. The DOF was a good choice for attenuating the harsh feeling this picture could show. All around is ugly but very well composed. Even the colors was a good choice. Really like the color, texture. Cool use of DOF. I like the tones. lovely image, the colours are stunning. i like the way the shallow depth of field makes the whole bend backwards. Message edited by author 2007-08-19 07:06:30. A very poignant photograph, which I do think is enhanced by the DOF blur. Very much like the light and textures. Proudly hosted by Sargasso Networks. Current Server Time: 04/22/2019 02:56:16 AM EDT.